The defense has rested its case in Luke Van Hemert’s murder trial in Oskaloosa. Van Hemert is charged with second degree murder in the death of William Penn University basketball player Marquis Todd in March of 2018. 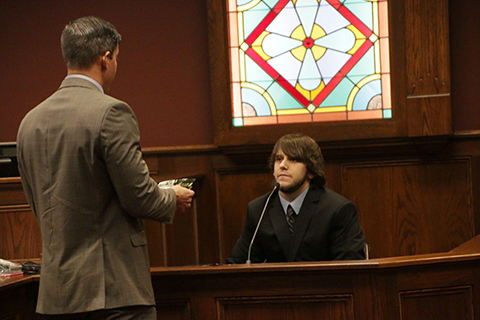 Van Hemert took the stand in his own defense Friday (4/12). He said when William Penn basketball player Michael Donaldson drove by his house after an earlier accident where Donaldson’s car hit Van Hemert’s, “I was scared. I didn’t want the situation to escalate.” Van Hemert testified that he tried tackling Todd, but Todd got on top of him and hit Van Hemert several times in the face. That’s when Van Hemert pulled a pocketknife out of his pocket and stabbed Todd. Van Hemert said that’s when Todd got off of him and walked away. Van Hemert said he then ran behind his house and threw the knife toward the Community Stadium track, which is near his home. Van Hemert admitted he didn’t tell police that he had a knife, nor did he mention he had thrown a rock or “chunk of concrete” at Donaldson’s car. Iowa Assistant District Attorney Andrew Prosser noted that Van Hemert told police Todd had hit him just once. When Prosser asked why Van Hemert would minimize the incident, including having Donaldson drive towards him and the fight, Van Hemert replied, “I was scared.” The jury will get instructions from Judge Lucy Gamon on Monday (4/15).